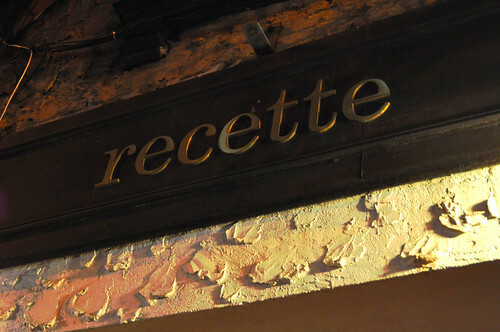 This past Friday, Linda and I went out to Recette in the West Village to belatedly celebrate my birthday. Upon deciding where to go, Linda and I perused through the New York City restaurants on the list of 2012 James Beard Award semifinalists for some suggestions. We stumbled upon Recette under the "Rising Star Chef of the Year" category, where its chef, Jesse Schenker, has been nominated. The menu seemed way too good to pass up, so we were good to go. An American restaurant that "marries traditional and progressive techniques and flavors," Recette (French for "recipe" -- love this!) originally began as a supper club pop-up as a collaboration between Chef Schenker (formerly of Gordan Ramsay at the London) and Per Se pastry alum, Christina Lee, in East Harlem. The move from catering to brick-and-mortar has not changed the restaurant's mission, i.e., continuing to "celebrate bold flavors and playful touches." 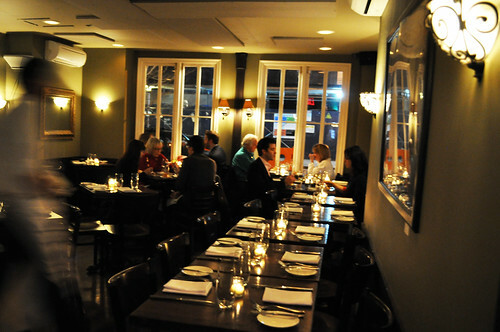 Inside the intimate dining area of Recette -- very West Villagesque. Upon being seated, a man, who was the uncannily splitting image of a younger Stanley Tucci came by to introduce himself as our server for the night. I knew right then and there that we had to prepare for a wild ride ahead (in the best way, of course). The menu at Recette is broken down into snacks and plates, giving diners a chance to find something appealing for their own palates as well as the ability to order several dishes (without just committing to two (i.e., appetizer and main course). The plates are sized in a way for the diner to have a few for himself/herself or to share several more plates among a group of guests. The menu also changes frequently to "showcase fresh products and twists on seasonal American favorites." We started with a little something from the "snack" category. These were the salt cod fritters with lamb sausage ragù and curry aioli. I didn't think it would happen with this, but I was quite taken with the salt cod fritters. They were really, really good, as they came to us nice and hot with a wonderful salty-savory banter between the cod fish and the lamb sausage. The spiciness from the lamb also allowed the salt cod inside the fritter to be easier on the palate (otherwise, it would have been straight salted fish). The aioli also provided a cooling layer to tame the bold flavors of the fish and lamb in a well-flavored harmony. Definitely a must-order. Next, we had the lobster torchon with marinated wild mushrooms, olive purée, and micro celery. The accompanying vegetable medley here was especially delectable as the flesh of the lobster along its shell was mixed right in, giving it a meaty base to boost the vegetables' flavor even further. The torchon of lobster was absolutely tender and lightly buttery and tasted even better with the mushrooms, olives, and celery. 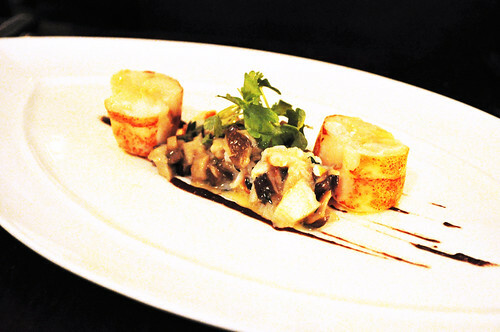 The components of this dish worked very well together, each tasting better when enjoyed simultaneously. As a recommendation from our very own "Stanley Tucci," we decided to get the "onion soup" with onion espuma (foam), oxtail, gruyere, and consommé (clear broth). The quotations surrounding the soup are intentional, in a manner similar to the quoted menu items that Marcus and I have observed and noted during our visit to Chef Thomas Keller's Yountville restaurant, The French Laundry. Essentially, this "onion soup" was an aerated soup which emulated the same delicious taste and flavors of the classic French onion soup without its typically dense and heavy consistency but with the lovely bonus of braised oxtail meat waiting to be discovered at the bottom of the soup bowl. 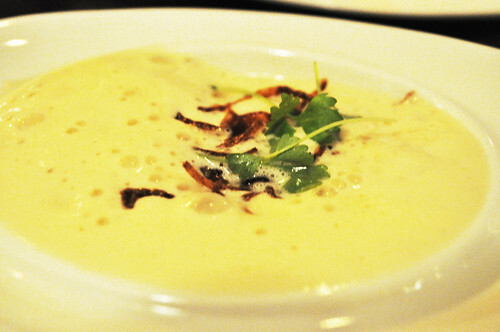 Every spoonful was like taking in a beautiful cloud of onion-flavored waves with the creamy gruyere riding its peaks. The oxtail meat was incredibly tender, falling apart in the way after several hours of dedicated braising. You'd be a fool to pass on this dreamy bowl of sublime liquid air. 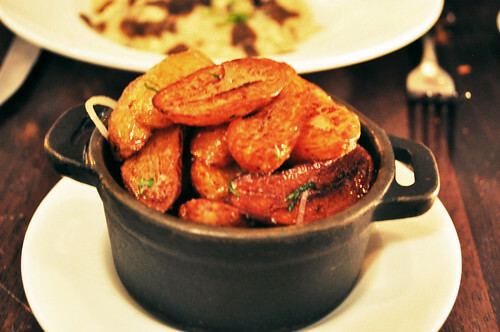 A long time guilty treat of ours, Linda and I couldn't have a meal at Recette without having ordered the duck fat fingerlings. Coated in a nice layer of duck fat, these fingerlings were rich and oily with slightly burnt skin, giving it some texture and character. This was the perfect side dish to go along with our next two plates. Here we had the Berkshire pork belly with rock shrimp, turnips, romesco (a Catalonian sauce typically made from almonds, pine nuts, hazelnuts, roasted garlic, olive oil and nyora peppers), and sherry caramel. The meat itself was very soft and tender, going really well with the hearty. winter flavors of sherry, caramel, and toasted nuts. The small piece of rock shrimp also seemed out of place, while the turnips were crisp and crunchy. I only wish the interior of the pork belly had absorbed these savory flavors into its warm and flesh. Otherwise, it was pretty good. The last of our plates before dessert was the orzo with sunchoke purée, forest mushrooms, Parmesan cheese, and shaved black winter truffles. Simply put, this was ahhh-so-amazing. 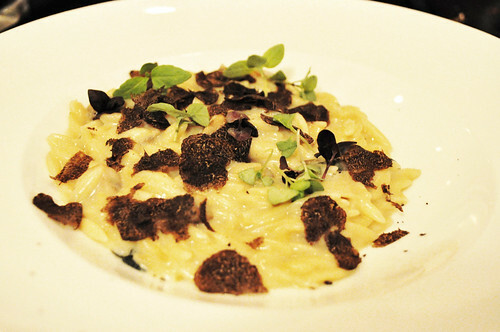 Definitely on the pricier side of pasta dishes (a whopping $41), but the thin, black-spotted medallions justify the price point, delivering an explosively umami-rific (my very own lexiconic creation) experience on the palate. You not only have those black wisps lingering a while along your taste buds but this dish's other ingredients, mushrooms and Parmesan cheese (both of which are two elements of the "ultimate umami trifecta" -- tomato is the other) underscore further the realms of umami in a singular dish in the most natural way possible. The price is hefty, so I advice if you're in a group -- take advantage. You can have several bites with some of your closest friends, sharing in a seemingly well-kept secret. I'm already yearning for some more! So Linda and I cheated a little bit. The table next to ours -- a party of four -- had ordered four different desserts (pretty much all of the offerings on the menu) to share amongst the table. We noticed right as they were all finishing up, taking note of which dessert had been essentially demolished and it was the deconstructed "s'mores" dessert with graham cracker ice cream, toasted homemade marshmallow, and "hot" chocolate ganache. In many ways, the presentation here (the deconstructed aspect, for sure) reminded me of the "pecan pie" that Linda and I had at Chef David Santos's Um Segredo Supper Club weeks prior. 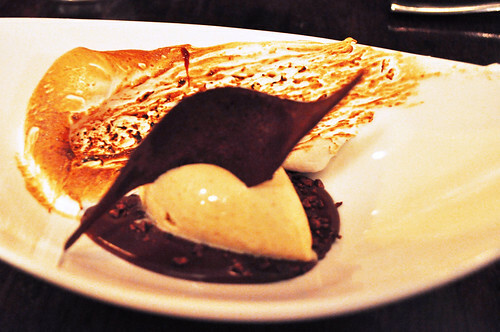 The toasted homemade marshmallow, resembling the tail of a fiery comet, which to me was quite fitting, considering the "hot" chocolate ganache (again with his deliberate use of quotation marks) had a tickling spiciness on the finish of each bite. It was as if those young days of campfires and scout troops flashed forward into the gourmet, more refined ways of adulthood, with the inner child giggling right behind. Highly recommend this dessert -- it'll send you back to the times of slumber parties and sweet comfort foods. The kitchen also gave us a complimentary dessert -- the passionfruit "tart" with white chocolate, Champagne foam, and spiced orange. 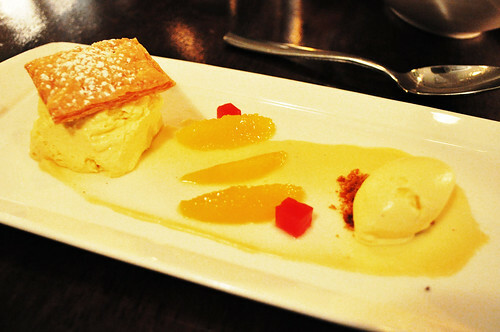 The puff pastry (the "tart" part, I'm guessing) was very fresh and had a flaky crumble to it, complementing the spiced orange slices and delicate flavors of champagne and white chocolate. Didn't love this as much as the "s'mores" dessert, but still very enjoyable if you're more of a fruit dessert kind of person. Chef Lee's pastry expertise is undoubtedly impressive and articulate, which is refreshing to see in a world that is saturated with mediocre, run-of-the mill haute pastry. 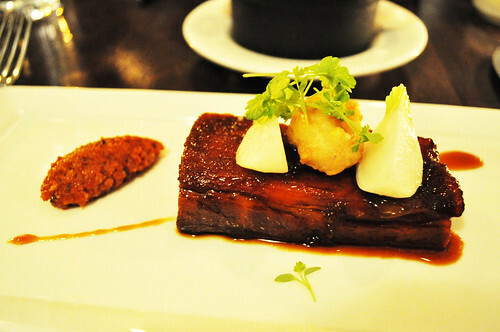 Findings: In summary, Recette gave Linda and me an extraordinary dining experience by way of small plates and snacks. Given the design and structure of the menu to move away from set "courses," Chef Jess Schenker ensures his patrons are not left hungry but happily sated. The overall cohesion of ingredients on these relatively smaller, portioned dishes was more conducive to trying more items than a traditional menu would permit for (both cost- and portion-wise). This is no American tapas joint where some bites can be considered afterthoughts. Instead, we set forth for a journey of six shared plates, each one distinctly different from the next, that teased, amused, gratified, and delighted our palates for the next few hours, while we munched and chatted away. And while we did not directly participate in a formal tasting (a five- and seven-course are available at Recette), our awesome server ("Stanley Tucci") informed us that a "tasting" here does not require the entire table to have the same rundown of courses -- it can be tailored to each individual's likes, dislikes, preferences, and the like. Score! Another plus one for Recette! Totally going to try doing that for my next visit! The things I would repeat again would be the salt cod fritters, the orzo, the "onion soup" as well as the "s'mores" -- total home runs! All in all, Recette certainly has the "recipe" for a memorable dining experience (haha, get it?!). I definitely know that I'll be back for more -- we were only able to conquer have the menu, after all! The service was wonderful (thank you, "Stanley Tucci"!) -- you really felt at home, even among the bustling in the kitchen and the shuffling in the super cozy dining area. So if you're in the neighborhood, make a stop here! You won't want to leave after your first few bites! Price point: $12 for each snack, $15-41 for each plate, $8 for each side, $8-10 for each dessert.